These permanent multimedia markers can be used on most indoor or outdoor surfaces, including paper, metal, glass, wood, plastic, and CDs. 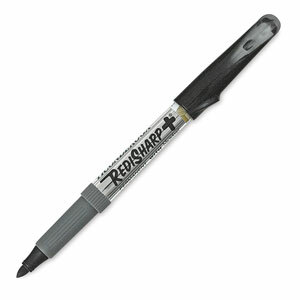 The waterbased ink in these markers won’t bleed through paper, and their barrels feature a patented thumb button cap. A Microban finish inhibits the growth of odor and stain-causing bacteria. Set of 4 — Set includes one each of Red, Blue, Green and Black. ® Dixon is a registered trademark. ® Ticonderoga is a registered trademark.® Microban is a registered trademark. ™ RediSharp Plus is a trademark.